Cropdusters found guilty of illegal spraying near Cordoba, Argentina, Ecuador’s Tungurahua volcano spews lava and ash, and Chile to open up lithium mining. UPDATE: In a landmark trial, a farmer and a pilot have been convicted of illegally cropdusting too close to a neighborhood in Cordoba, Argentina. This is the first time in Latin America a trial has looked at the application of chemicals on crops and their adverse effects on the population. The farmer and pilot received conditional sentences of three years for violating regulations that banned the use of cropdusting chemicals in the neighborhood of Ituzaingo Anexo, in Cordoba. More LatAmSci coverage here. Argentina is the world’s third largest exporter of biofuels, behind the U.S. and Brazil. Of the 1.4 million tons of biodiesel Argentina produces annually from soybeans, the European Union imports 90%. Vegetable glycerol, a byproduct of the chemical reaction used to make biodiesel, is created in large quantities—roughly 110 kilos are produced for each ton (1,000 kilos) of biodiesel. Researchers in Argentina looking for new uses for crude glycerol have found that mixing it with yuca (cassava) flour makes an adhesive. They are hoping this vegetable-based adhesive can be used in attaching labels to bottles, a process that until now has used synthetic petroleum-based adhesive. Ecuador’s Tungurahua volcano has started spewing lava, ash and vapor. Credit: Jorge Loor Bowen via Flickr. Brazil is advising Chile on how to educate its students about healthier eating. Last week, officials working with Brazil’s national school nutrition program (PNAE) met with Chilean directors to share their experiences with implementing nutrition education. Brazil’s PNAE, in addition to teaching schoolchildren of all ages better eating habits, works with communities and local farmers. Brazilian law stipulates that 30% of food eaten in schools should be sourced from family farms. The group is also working towards creating school farms. Beginning on September 24, the Chilean government will open concessions to private companies to mine the country’s lithium reserves. Officials from the Federation of the Unions of Supervisors and Professionals of Codelco—the state-owned copper company—have criticized the lithium concessions, calling the move “blind” as it will be diverting benefits from the very Chileans who own the resource. Chile lithium accounts for 18% of the world’s total reserves, according to a new study published by the Mining Center at Gustavo Lagos Catholic University. Colombia’s Lake Tota, the country’s largest lake, has received the World Wetlands Network’s ‘Grey Globe’ award for facing serious threats. Fertilizers and chemicals flow into the lake from the region’s onion farms. Caged trout fisheries are also a source of pollution. The BBC visited the lake, 200 kilometers north of Bogota. Ecuador’s Tungurahua volcano 135 km southeast of Quito has been spewing lava, vapor and ash since last weekend. More than one hundred families have evacuated. An eruption in 1999 forced the year-long evacuation of 15,000 inhabitants in nearby Banos. 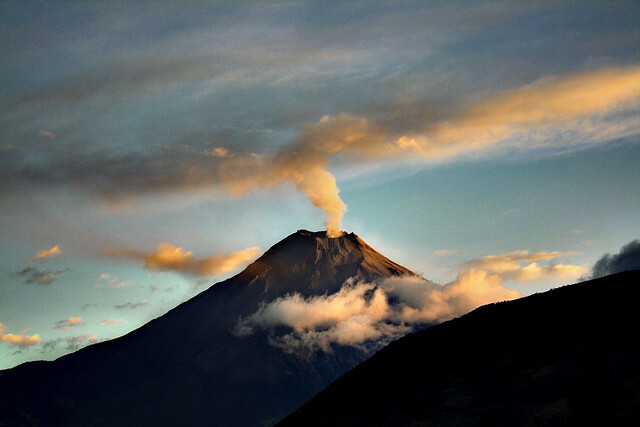 Tungurahua means ‘Throat of Fire’ in the indigenous Quechua language. The BBC has a video here. Archeologists in Honduras are uncovering clues to the disappearance of the Mayas. Researchers say the city of Copan was abandoned with buildings still under construction and tools left about. “We say pieces were missing but there isn’t evidence of looting, rather that the Mayas started construction and didn’t finish it; these are the most recent constructions in Copan, which show that it was an abrupt end,” Rene Viel, a French researcher, told AFP. A Mexican healthcare reform designed to cover those Mexicans without health insurance has been a “runaway success,” says a new study in The Lancet. The healthcare program, enacted in 2003, has covered 50 million Mexicans—about half the country’s population—that weren’t previously covered. Seguro Popular, as its called, has also shifted in response to scientific assessments of its effectiveness over its 9 year tenure.